How Can I Reconcile with a Wife Who Hates Me? Your wife once loved you, now your wife hates you. This is a situation you can learn to turn around. When your wife says she hates you or is behaving that way, it is an honest reflection of her feelings. 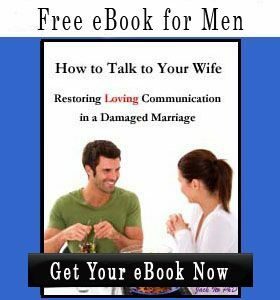 Men who want to reconcile with their wives often approach this from an analytical perspective–evaluating evidence, arguing, and attempting to persuade their wives to feel differently. This approach will bring resistance and distance until you feel like giving up. Re-connection must begin with connection rather than argument. This article will help you get started with that. As crazy at it seems, some wives will say and do terrible things to their husbands in order to be reassured that their husbands are committed to them. Their reasoning is that if they can treat their husbands badly and their husbands still put up with it, then their husbands must really love them. This is particularly characteristic behavior for needy women, who constantly need reassurances. If your wife is constantly checking your whereabouts and hates it when you go out without her, she certainly does not hate you. She is actually afraid of losing you. You need to learn how to put boundaries around her needy behavior instead of feeding the problem by reassuring her. You also need to help her to feel loved when she is not being needy. These two behaviors will reduce her neediness and help her to be nice to you instead of hating you. Chapter 11 in my book on overcoming neediness (“how to help a needy partner”) has a lot of advice I could not include here. This is particularly true for a wife who says she hates you or is acting in a hateful way, but is making no effort to get out of your relationship. Typically, this kind of wife is angry for a good reason, but that reason may be entirely in the past. For example, maybe you failed to be there when she really needed you or you cheated on her. Just because you have changed and become a loving husband doesn’t mean that she can automatically get rid of her anger. Many men don’t understand why making changes women want don’t lead to reconciling. 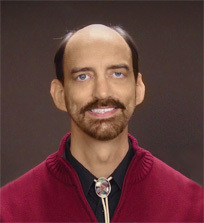 They also become frustrated when apologies and promises to change lead to very temporary improvement, if any. It is like scratching a poison ivy itch–the relief is short lived and the itch (need for your apology) comes back even stronger. This can even develop into a lifetime pattern of unforgiveness on her part until you finally give up on the relationship. At that point she is likely to let go of her anger, but too late for you. You must learn to stop rewarding her attacking behavior. She will escalate her behavior at first, but then you will get slow improvement if you are being attractive and using good connection skills. Your wife may have either been too disconnected from you for too long, or already be having an affair. In either case, she is likely to be creating emotional distance from you so that she can either feel better about leaving you or about having an affair. In this case, her reasons for hating you are likely to be flimsy or trivial. Her level of hatred will seem to be all out of proportion to anything you have done. No matter how sorry you are, she won’t consider you to be sorry enough. And, she will be actively moving to leave your relationship. Focusing on apologizing or putting back into your relationship whatever she hates you for not providing is not going to end her hateful behavior. You must understand that her goal is to get something or someone other than you that she believes will make her life better. This is the most common situation that men are in when I help them to reconcile with my Re-Connections Coaching Package. I help them with skills needed for the four step approach outlined below. Trying to convince your wife to want something she doesn’t is not going to help her to relax. It will stress her out like a telemarketer who repeatedly calls trying to sell you a product you don’t want. The convincing approach will make her want to get space and will shut her down so that she won’t even talk to you. You must be able to look at the relationship from her perspective and consider the validity of her ideas. Although you are likely focused on what you want, what you want is the last thing she is concerned about at this time. Typically my clients are able to get their wives to relax with them within two weeks by changing their focus to what their wives want. Because she is relaxed (from step one), you can build your communication with her using good connection skills, just as you would with any woman. The better you are at these skills, the more she will enjoy talking with you. The re-connection process will have begun. If you have done well helping her to enjoy talking with you, then you can start to become friends. Consistency and being more attractive than other men (in every sense–not just the physical) is important for helping to shift her desires toward you and away from the greener grass she believes is out there. If she is having an affair, you also need to use good boundaries to ensure that she can not have her cake and eat it, too. Loving feelings can only come back after trust and enjoyment are restored. This is why men can not get their wives to be in love with them simply through reasoning. Just as with dating a single woman, you need to progress through relationship building stages before she will ready marry (recommit) to you. Looking for one step solutions will result in failure, no matter what you try. You can’t just shower her with love or give her space and expect her to change her feelings about you. 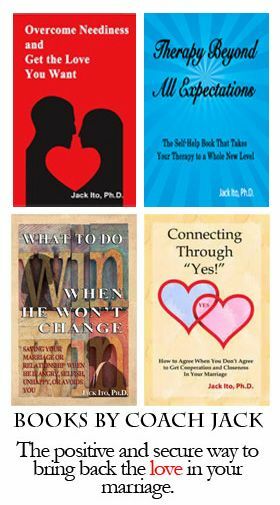 As you can see from these four stages of reconciling, the major skills involved are connection skills, learning how to be more attractive than other men, and the correct use of boundaries. Most coaching clients are able to learn the basics of these skills within a four week coaching package. 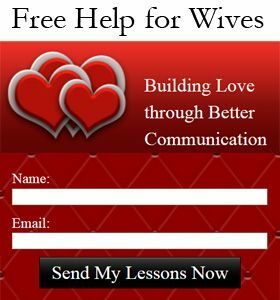 You can get started learning coaching skills with my free ebook on how to talk to your wife in a way that makes her want to talk to you more. I encourage you to use whatever resources you need to change not your wife’s thinking–but her feelings. Getting her to be in love with you again, and then maintaining your relationship better, are the only things that will keep your relationship on the right track for the years ahead.